MTHYBRID, MT2002, and MT64: Variants of the Mersenne twister RNG. The MTHYBRID method is the default RNG in SAS, beginning with the SAS 9.4M3. If your browser does not support embedded video, you can go directly to the video on YouTube. Sarle, W. and Wicklin, R., 2018, "Tips and Techniques for Using the Random-Number Generators in SAS," Proceedings of the SAS Global Forum Conference. The post Video: New random number generators in SAS appeared first on The DO Loop. In SAS, the reserved keyword _NULL_ specifies a SAS data set that has no observations and no variables. When you specify _NULL_ as the name of an output data set, the output is not written. The _NULL_ data set is often used when you want to execute DATA step code that displays a result, defines a macro variable, writes a text file, or makes calls to the EXECUTE subroutine. In those cases, you are interested in the "side effect" of the DATA step and rarely want to write a data set to disk. This article presents six ways to use the _NULL_ data set. Because the _NULL_ keyword is used, no data set is created on disk. You can compute a quantity a DATA _NULL_ step and then use the PUT statement to output the answer to the SAS log. For example, the following DATA step evaluates the normal density function at x-0.5 when μ=1 and σ=2. The computation is performed twice: first using the built-in PDF function and again by using the formula for the normal density function. The SAS log shows that the answer is 0.193 in both cases. You can use a null DATA step to display characteristics of a data set. For example, the following DATA step uses the PUT statement to display the number of numeric and character variables in the Sashelp.Class data set. No data set is created. You can also store these values in a macro variable, as shown in the next section. You can use the SYMPUT or SYMPUTX subroutines to create a SAS macro variable from a value in a SAS data set. For example, suppose you run a SAS procedure that computes some statistic in a table. Sometimes the procedure supports an option to create an output data that contains the statistic. Other times you might need to use the ODS OUTPUT statement to write the table to a SAS data set. Regardless of how the statistic gets in a data set, you can use a DATA _NULL_ step to read the data set and store the value as a macro variable. The following statements illustrate this technique. PROC MEANS creates a table called Summary, which contains the means of all numerical variables in the Sashelp.Class data. 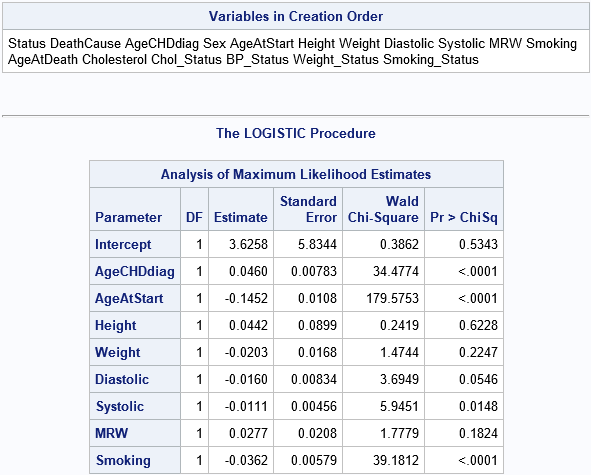 The ODS OUTPUT statement writes the Summary table to a SAS data set called Means. The DATA _NULL_ step finds the row for the Height variable and creates a macro variable called MeanHeight that contains the statistic. You can use that macro variable in subsequent steps of your analysis. For a second example, see the article "What is a factoid in SAS," which shows how to perform the same technique with a factoid table. Sometimes there is no procedure that computes the quantity that you want, or you prefer to compute the quantity yourself. The following DATA _NULL_ step counts the number of complete cases for the numerical variables in the Sashelp.Heart data. It then displays the number of complete cases and the percent of complete cases in the data. You can obtain the same results if you use PROC MI and look at the MissPattern table. #5. Edit a text file or ODS template "on the fly"
This is a favorite technique of Warren Kuhfeld, who is a master of writing a DATA _NULL_ step that modifies an ODS template. In fact, this technique is at the heart of the %MODSTYLE macro and the SAS macros that modify the Kaplan-Meier survival plot. Although I am not as proficient as Warren, I wrote a blog post that introduces this template modification technique. The DATA _NULL_ step is used to modify an ODS template. It then uses CALL EXECUTE to run PROC TEMPLATE to compile the modified template. All the previous tips use _NULL_ as the name of a data set that is not written to disk. It is a curious fact that you can use the _NULL_ data set in almost every SAS statement that expects a data set name! For example, you can read from the _NULL_ data set. Although reading zero observations is not always useful, one application is to check the syntax of your SAS code. Another application is to check whether a procedure is installed on your system. For example, you can run the statements PROC ARIMA data=_NULL_; quit; to check whether you have access to the ARIMA procedure. If I don't want to this output (but I want the option to see it again later), I can modify the DebugName macro (%let DebugName = _NULL_;) so that the CONTENTS and MEANS procedures do not produce any output. If I do that and rerun the program, the program does not create any debugging output. However, I can easily restore the debugging output whenever I want. In summary, the _NULL_ data set name is a valuable tool for SAS programmers. You can perform computations, create macro variables, and manipulate text files without creating a data set on disk. Although I didn't cover it in this article, you can use DATA _NULL_ in conjunction with ODS for creating customized tables and reports. What is your favorite application of using the _NULL_ data set? Leave a comment. 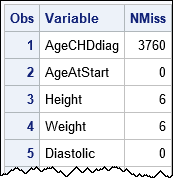 The post 6 ways to use the _NULL_ data set in SAS appeared first on The DO Loop. The SAS language provides syntax that enables you to quickly specify a list of variables. SAS statements that accept variable lists include the KEEP and DROP statements, the ARRAY statement, and the OF operator for comma-separated arguments to some functions. You can also use variable lists on the VAR statements and MODEL statements of analytic procedures. Use the _NUMERIC_, _CHARACTER_, and _ALL_ keywords to specify variables of a certain type (numeric or character) or all types. Use a single hyphen (-) to specify a range of variables that have a common prefix and a sequential set of numerical suffixes. Use the colon operator (:) to specify a list of variables that begin with a common prefix. Use a double-hyphen (--) to specify a consecutive set of variables, regardless of type. You can also use a variation of this syntax to specify a consecutive set of variables of a certain type (numeric or character). Use the OF operator to specify variables in an array or in a function call. Use macro variables to specify variables that satisfy certain characteristics. Some companies might discourage the use of variable lists in production code because automated lists can be volatile. If the number and names of variables in your data sets occasionally change, it is safer to manually list the variables that you are analyzing. However, for developing code and constructing examples, lists can be a huge time saver. An example of using the _ALL_ keyword is shown in the section that discusses the OF operator. In many situations, variables are named with a common prefix and numerical suffix. For example, financial data might have variables that are named Sales2008, Sales2009, ..., Sales2017. In simulation studies, variables often have names such as X1, X2, ..., X50. The hyphen enables you to specify the first and last variable in a list. The first example can be specified as Sales2008-Sales2017. The second example is X1-X50. The previous sections used wildcard characters to match variables that had a specified type or prefix. In the previous sections, you will get the same set of variables regardless of how they might be ordered in the data set. You can use a double-hyphen (--) to specify a consecutive set of variables. The variables you get depend on the order of the variables in the data set. In this example, the data set B contains the variables x3, C1, C2, Z, W, and C4. If you use the double-hyphen to specify a list, be sure that you know the order of the variables and that this order is never going to change. If the order of the variables changes, your program will behave differently. The previous sections demonstrate how you can use syntax to specify a list of variables to SAS statements. In contrast, this section describes a technique rather than syntax. It is sometimes the case that the names of variables are in a column in a data set. There might be other columns in the data set that contain characteristics or statistics for the variables. For example, the following call to PROC MEANS creates an output data set (called MissingValues) that contains columns named Variable and NMiss. Suppose you want to keep or drop those variables that have one or more missing values. The following PROC SQL call creates a macro variable (called MissingVarList) that contains a space-separated list of all variables that have at least one missing value. This technique has many applications and is very powerful. This article shows six ways to specify a list of variables to SAS statements and functions. The SAS syntax provides keywords (_NUMERIC_, _CHARACTER_, and _ALL_) and operators (hyphen, colon, and double-hyphen) to make it easy to specify a list of variables. You can use the syntax in conjunction with the OF operator to pass a variable list to some SAS functions. Lastly, if the names of variables are stored in a column in a data set, you can use the full power of PROC SQL to create a macro variable that contains variables that satisfy certain criteria. Do you use shorthand syntax to specify lists of variables? Why or why not? Leave a comment. The post 6 easy ways to specify a list of variables in SAS appeared first on The DO Loop. In a recent blog post, Chris Hemedinger used a scatter plot to show the result of 100 coin tosses. 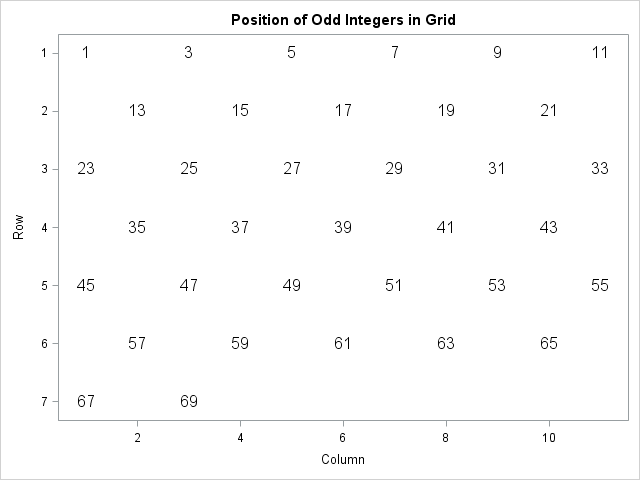 Chris arranged the 100 results in a 10 x 10 grid, where the first 10 results were shown on the first row, the second 10 were shown on the second row, and so on. Placing items along each row before going to the next row is called row-major order. Place the first item at (1, 1). Assume the n_th is placed at position (r, c). 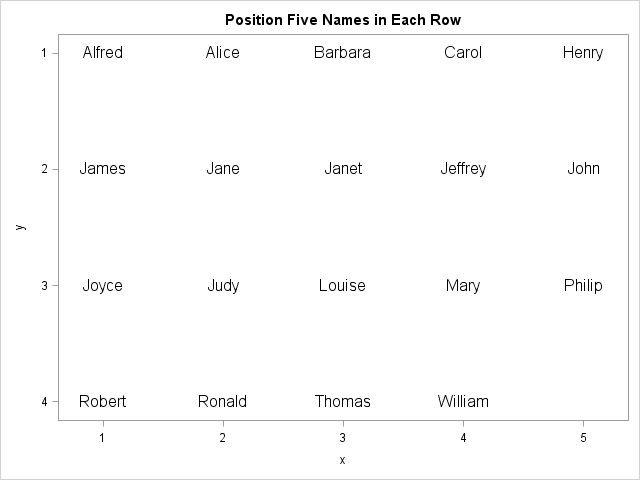 Place the (n+1)st item at position (r, c+1) if there is room on the current row, otherwise place it at (r+1, 1), which is the first element of the next row. The inductive scheme is also called an implicit or recursive formula because the position of the (n+1)st item is given in terms of the position of the nth item. The inductive algorithm is easy to implement and to understand. However, it does not enable you to easily determine the row and column of the 1,234,567_th item if there are 11 items in each row. Nor does it enable you to compute the positions when the index increments by a value greater than 1. To answer these questions, you need to use an explicit or direct formula. The formulas might look strange because they subtract 1, do a calculation, and then add 1. This formula assumes that you want to count the items, rows, and columns beginning with 1. If you prefer to count from 0 then the formulas become MOD(n, Nx) and FLOOR(N/Nx). The explicit formula is used in the SAS/IML NDX2SUB function, which tells you the row and column information for the n_th item in a matrix. In summary, you can use an implicit formula or an explicit formula to arrange items in rows, where each row contains Nx items. The implicit formula is useful when you are arranging the items sequentially. The explicit formula is ideal when you are randomly accessing the items and you need a direct computation that provides the row and column position. Finally, if you want to arrange items in column-major order (down the first column, then down the second,...), you can use similar formulas. 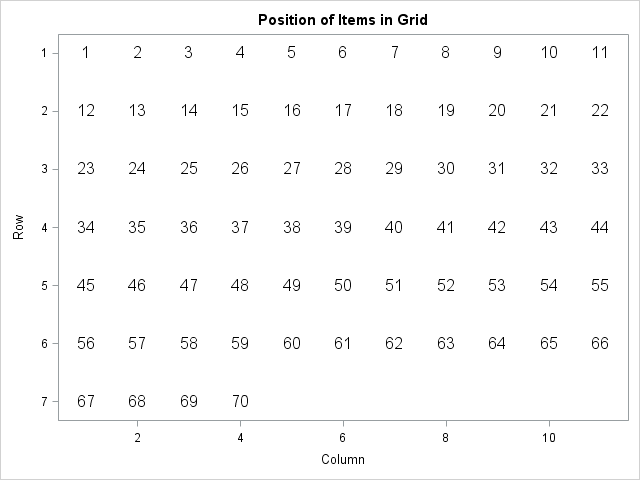 The row position of the n_th item is 1 + mod(n-1, Ny) and the column position is 1 + floor((n-1) / Ny), where Ny is the number of rows in the grid. The post Position items in a grid appeared first on The DO Loop.